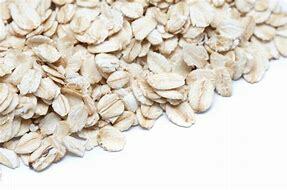 How To Make Your Own: Take groats, rolled or instant certified gluten-free oats, place in high output blender, food processor, or coffee grinder and grind until fine. In a high speed blender, grind the oats into a fine flour. Transfer to a mixing bowl and add the coconut sugar, baking powder, vanilla, salt, and lemon juice. Mix briefly to combine. Soften the coconut butter by microwaving for 15-20 seconds. It should be easy to scoop out, not dry and crumbly. Add the coconut butter (or chilled banana). Use your hands to work it in until the texture is crumbly with small pebble-sized pieces. Add half of the non-dairy milk. Use your hands to mix/knead the dough. Add the rest of the milk slowly until you have a slightly sticky dough. Do not over work it, knead with fingertips just until combined. Add the frozen berries (I pulsed frozen strawberries in a blender for smaller pieces) and mix. Shape the dough into a circle at least 1 inch high and about 8 inches in diameter. Cut into 6 triangles and transfer to a baking pan lined with parchment paper. Bake for approximately 15 minutes at 425F or until golden brown on the edges. Remove from the pan, cool briefly, and then enjoy plain or with topping/spread of choice! Notes: To make them fat-free, replace the coconut butter with 1 medium ripe and chilled banana. You may need to decrease the amount of non-dairy milk slightly with this option, start with 1/2 cup and adjust as needed. Just barely melt the coconut butter. Stir in the maple syrup, and then slowly add the nondairy milk until the texture becomes smooth and drizzle-able. Don't worry, it will clump up initially when you add the milk, but keep going and it will smooth out again. Please note: Glutenwatchers has no affiliation or involvement in this video or with the makers of it.